One of my reading goal this year was to finish the Malazan Book of the Fallen series and so far, I am failing. This series is great but all the installments are huge and they always take me ages to read so, even though I know I am probably not going to finish the whole series, I would like to read Reaper’s Gale! I received this book as a Christmas present last year and I am really intrigued by it, it’s a literary science book following a priest who’s sent on foreign planet to explain/teach The Bible to an alien population while dealing with the fact that, on Earth, his wife is dying of cancer. Sounds depressiong as hell but interesting. I’ve heard that Faber’s writing style is gorgeous so I will definitely give this book a try! This book was one of my anticipated releases in 2015 and I still haven’t picked it. It sounds wonderful and I have it on my Kindle, I just have to read it now! I know that I am going to love this book: I really liked all the previous books in this trilogy however, it’s so good that I don’t want it to be over which is why I still haven’t started it yet. Nevertheless, I want to know how it’s going to end so I’ll probably read it before the end of the year! The last remnants of the human race left a dying Earth, desperate to find a new home among the stars. Following in the footsteps of their ancestors, they discover the greatest treasure of the past age—a world terraformed and prepared for human life. But all is not right in this new Eden. In the long years since the planet was abandoned, the work of its architects has borne disastrous fruit. The planet is not waiting for them, pristine and unoccupied. New masters have turned it from a refuge into mankind’s worst nightmare. Now two civilizations are on a collision course, both testing the boundaries of what they will do to survive. As the fate of humanity hangs in the balance, who are the true heirs of this new Earth? 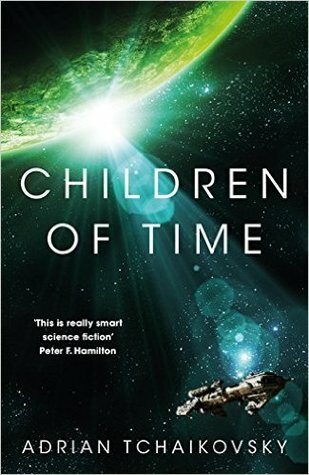 Children of Time was the last book that I had to read to complete my personal goal of reading the entire Clarke shortlist before the winner announcement (which is tomorrow by the way). Before reading it, I read two meh books (Best Served Cold and The Dragon Engine) and because of that, when I picked it up I was like “Well book, you better be damn good” which is not always the right mind set to start a book. However, after reading the prologue, I realized that it was exactly the right book for me which is weird because it wasn’t the book in the shortlist that I was the most looking forwatd to (hence why I read it last). Children of Time is set in world where Earth has been destroyed by humans (because of wars and terrorist attacks)and the Human Race tries to found a new home and initiates a ton of different projects to terraform planets. Avrana Kern is a scientist working on one of those project, however, she doesn’t think that humans can be saved, she wants them to start over, from the beginning, as monkeys. Basically, Kern and her team want to launch monkeys on their terraformed planet and inject them with a nano-virus that is going to make them evolve faster. However, because of a terrorist attack during the launch, the shipment of monkeys is destroyed and the nano-virus is the only one to touch the planet. The virus is supposed to attack only monkeys and be completely inneficient with other mammals, but, Kern and her team don’t realize that they’re other living things on this planet that aren’t mammals, like for example, spiders. And of course, the virus works on them. Thousands of year later, the last remnant of The Human Race living on a generation ship, The Gilgamesh, approachs Kern’s world. They don’t have anywhere else to go, Kern is their only hope but, they aren’t the only wanting to live there. This book was freakin’ awesome. From the start, I knew that I was going to enjoy it, the prologue was intense, if you’re interested by the book, download a sample from Amazon or go to the library and read the prologue. I’m 99% sure that you’ll want to continue on. I really liked the way the book was structured: chapters alternate between the human crew of the Gilgamesh and the spiders on Kern which allows us to assist to the evolution or stagnation of the two races (the story spans centuries and centuries. This book could have turned into a horror story (I mean, it is dealing about giant uplifted spiders), but i didn’t. I was expecting a thriller where humans are hunted by Aragog-like huge spiders but, it’s definitely not this kind of book (fortunetely because I don’t see myself ever reading a man hunt where the hunter is an arachnid, no thanks, I wouldn’t be able to sleep after that!). This is a book deeply centered on the idea of humanity and evolution. It asks loads of questions such as the classic :What makes us human? However, it doesn’t ask it in a generic way if that’s makes any sense. It’s a book genuinely concerned by the actual answer. Does our humanity come from our looks? Our brains? Our sense of selves? Our ability to create? To communicate? Is the fact that we knows that we are going to die one day? If yes, then the spiders in this book are both human and alien, they are like us but they aren’t. How could they? They do not see the world like we do. Is this a reason to kill them? Does our inability to understand make them useless or worse dangerous? Do they wan’t to kill us? So, I just mentionned the fact that one of the characters, Holsten is a classicist. In this book, classicists are people who study older civilizations like the Old Empire (the name used for the humans who destroyed Old Earth), they are basically the last scholars in the universe. Their profession is looked down apon, indeed people found classicists obsolete and useless. Why would they want to study the Old Empire? If the Old Empire truly had answers, then they wouldn’t have destroyed the Earth right? It was really fascinating to read about it because it felt like something that could really happen, a reaction completely human human. So, to wrap up this review, I would say that Children of Time is a truly great science fiction book. The spiders weren’t anthropomorphized at all, the characters all felt human (even if some of them lacked a bit of depth), they’re all flawed but in an understandable way, the pacing was perfect (I never found myself skimming or bored) and it’s not an horror story. I would highly recommend it and I’m glad it was shortlisted. I was on my wishlist before but, since I am not a huge fan of spiders in general, I don’t think that I would have picked it up without the extra motivation! “Every civilization has its myths. Only one is true. I love reading about gods. They are the main reason I started a lot of series like the Malazan Book of the Fallen series by Steven Erikson or The Chronicle of the Unhewn Throne by Brian Staveley (to cite just a few): gods fascinate me. So, when I read the blurb of Koijiki, I knew that I needed to give this book a try. Koijiki follows the story of Keiko, an eighteen years old girl who travels to Tokyo after the disapperance of her father who left her with a mysterious note: “Go to Japan in my place. Find the Gate. My camera will show you the way.” Of course, when she gets to Tokyo, she discovers that she’s part of something bigger, something that may include an old quarrel between the Gods that created Japan, and she has to do everything in her power to save the world she knows. In this book, Japaneses legends meet Modern Tokyo, dragons set fire to subways and teenagers befriend spirits. I seriously wish this book could be turn into a Studio Ghibli anime or in a graphic novel, it would be fantastic and suit perfectly the story. It was very easy to picture the world, Yastuhashi didn’t drown the book in descriptions but everything setting felt real. Usually when I read, I can’t picture every scenes in my head (because of the excess (or lack sometimes) of descriptions), but, reading Koijiki, I realized that I could and it was a really neat experience. Koijiki is a good YA book, the heroine is smart, funny and it was easy to relate to .However, I would have liked to know a little more about her and since the book was pretty short and fast paced, I felt like I did not have time for that, which was a tad disappointing. Also, I found that some dialogues were a bit awkward, I couldn’t really imagine actual people talking like in real life but, overall, the writing was pretty good and easy to get through so it didn’t pull me out of the story as much as it could have. Koijiki is a debut-novel so it’s not that surprising and I’m sure that Keith Yastuhashi will improve that in future books! 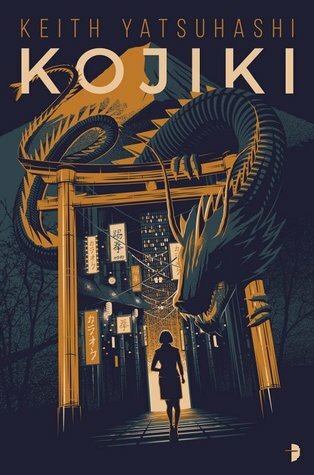 So, if you are looking for a YA full of Japanese legends, give Koijiki a try, it’s quick, I never read something quite like it before and, I forgot to mention it before, but, it doesn’t have any of the YA tropes that I dislike. Yes, you heard/read me correctly, there are no love triangles or heroines who act before they think: here you’ll find female friendships, cool spirits, dragons, gods and a good dose of action. I received a copy of this book from Netgalley. My thanks to Angry Robots. All opinions are my own. “Somewhere within our crowded sky, a crew of wormhole builders hops from planet to planet, on their way to the job of a lifetime. To the galaxy at large, humanity is a minor species, and one patched-up construction vessel is a mere speck on the starchart. This is an everyday sort of ship, just trying to get from here to there. 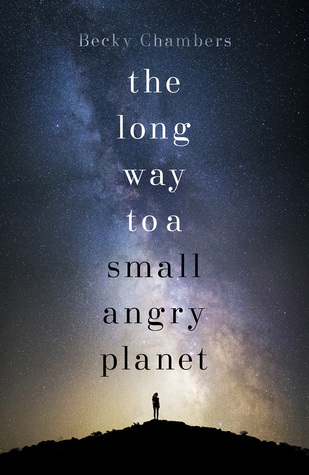 The Long Way to a Small Angry Planet is what I would call a feel-good book. It has a very thin plot: it mostly focuses on character relationship and it’s quite refreshing. Indeed, I love SF but it tends to be quite depressing (kind of like literary fiction): I do like this aspect of SF don’t get me wrong, seeing how humans could react in different world, how we could live in centuries or just how we could have behave in alternate histories setting, is for me, utterly fascinating even if, 99,9% of the time, it’s not utopian (or when it is, it’s not quite perfect (Too Like The Lightning by Ada Palmer)). This book is different. Like I said, the plot isn’t really important (it just follows characters working in a spaceship that “builds” wormsholes): the characters are the main focus. At the end of the book, it was very hard to let them go, I wanted to see more of their interactions (and I also wanted to work with them on the Wayfarer). The Long Way to a Small Angry Planet had really interesting ideas and themes such as inter-species relationship, how humans differ and look like the aliens and love. The whole aspect of inter-species relationship was very interesting to read about since I believe that it’s the first time that I encounter it in a novel (that isn’t Star Wars related). It’s a book about tolerance, sexual freedom and actual life in space. It’s a very good book and, if you’re tired to read only depressing SF about evil corporations, wars, ecological disasters and post-apocalyptic futures, I would highly recommend it! It reminded me a bit of The Goblin Emperor by Katherine Addison but for SF fans: the characters are genuinely good and try their best and it’s refreshing after reading dystopians (or grimdark fantasy in the case of The Goblin Emperor!). However, I do have some issues with it, I won’t talk about all of them because some of them are spoilers but, one the main character is in love with the ship’s AI, Lovey, and he wants the AI to have a physical body (which is possible in this world thanks to body kits). In the book, it never felt right; I thought that the AI agreed to do this only for the human, not because it/she wanted to, it was a bit cringy since I saw that more as emotional blackmail than an actual thought-out decision. It might just be me but I didn’t love this part of the story that much. They were other things that bothered me and lowered a bit my enjoyment of the story. So, would I like this book to win the Arthur C. Clarke Awards? Nop. Again it’s a good book, I wouldn’t be mad if it win of course but, Europe At Midnight and The Book of Phoenix are way more interesting in my opinion. A Small Angry Planet is good book but it didn’t offer new ideas or great discussions like Hutcherson’s book for example. Still, I’m glad I read it and I will be reading the sequel/companion, A Closed and Common Orbit when it will come out! “The armistice is months past but the memories won’t go away. ‘A harlequin, leaning against a tree stump and with a goblet of ale clasped in one outstretched hand. Beaumont felt chilled suddenly, in spite of the fire…Most likely it was the thing’s mouth, red-lipped and fiendishly grinning, or maybe its face, which was white, expressionless, the face of a clown in full greasepaint.’ Dennis Beaumont drove an ambulance in World War One. He returns home to London, hoping to pick up his studies at Oxford and rediscover the love he once felt for his fiancee Lucy. But nothing is as it once was. Mentally scarred by his experiences in the trenches, Beaumont finds himself wandering further into darkness. What really happened to the injured soldier he tried to save? I first heard about this novella when I read this fantastic review of it on the From Couch To Moon blog, I was intrigued enough to add it to my Amazon wishlist and I slowly started to forget it until I read my first issue of Interzone, a speculative fiction magazine where Allan is a contributor. I read one of her essays, I don’t remember what it was about but I really liked it at the time and when I realized that it was from the woman who wrote this award-winning novella, I realized that it must be a sign from Heaven or something like that I really needed to buy it (I don’t need much to buy books :P). If you’re new to this blog or if you don’t read religiously every post I write, then you might not know this but, I really dislike reading synopsis. I hate being spoiled and usually, synopses are way to detailed for me so I tend to skim the first half to see if it’s something I’m intrigued by and that’s all. I also have a bad memory so usually, if I don’t start a book just after reading its synopsis (which is extremely rare), I go into it completely blind. Admittedly, it’s not always the best habit since sometimes, I can expect things that are not accurate at all and be completely disappointed by the book (a recent example of this being Bodies of Water by V.H. Leslie) but sometimes, it works and with The Harlequin, it did. The Harlequin is set in a post-WWI England and it is the story of an ex-soldier slowly but inexorably going insane. It’s dark and twisted, it’s hard and disgusting but even if a part of you want to put the book down to see videos of cute pandas playing in the snow, you cannot stop reading. I read it in one sitting and, even though I was frowning the whole time, I didn’t stop once. The main character, Dennis Beaumont, is not a good guy. He is pretty despicable, he cheats on his fiancée, he can’t finish his studies, he doesn’t like to talk to people (he tends to be incredibly rude to them) and he’s haunted by his memories. It was hard to relate to him but at the same time, it was hard not to. I ended up rating it three and a half stars here and on Goodreads because I only base my ratings of my enjoyment of a story, and since the main character was a douchebag and the story was told from his perspective, my enjoyment level wasn’t very high. It doesn’t mean that it is a bad story: the writing, the atmosphere, the world and the pacing were superb and it is an extremely good novella. 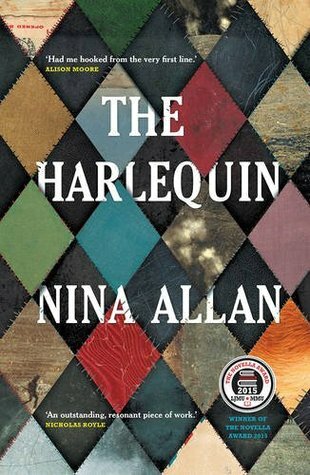 In The Harlequin, Nina Allan brought up really interesting discussions on gender, social changes in the 1920’s and PTSD and I highly recommend this to everyone! I read this book when it first came out right at the beginning of the year and I LOVED it. I gave it five stars and I was sure that it was going to be one of my favorite book of the year. However, the more I thought about it, the more I realized that it wasn’t that excellent. It is a very good book, I liked a lot it but, after reading some really awesome books this year, I don’t consider it to be one of my favorite reads of the year. I first read this book back in 2014 and I adored it, I re-read it in 2015 and I had troubles finishing it. I had a ton of issues with the characters who were constantely making dumb decisions, I found the whole plot super cheesy and the writing pretty bad. I think that it’s because, when I first read it, I hadn’t read that much books written in English before and that I couldn’t see when a book was well-written or not. I am pretty sure that if I had to read it again, I would give it one star. I read the original trilogy (The Final Empire, The Wel of Ascension and The Hero of Ages) back in 2014, I liked the first and third book quite a bit, however, the more I hear people prasing this series the less I like it. It’s a good trilogy, the ending is amazing but I don’t think that it is the best adult fantasy out there and I think that it is really overhyped. So far I only mentionned books that I liked a lot initially, well, it’s not the case of The Catcher in the Rye at all. I read it for an English class in highschool and, oh my, I despised it. It was almost painfull to read actually. It took me like three months to finish and it’s not even 300 pages long. I couldn’t relate to the main character at all. What changed? Well I realized that I actually shared some character traits with Holden Caulfield and that’s probably why I hated the book so much. It’s hard to read a bok where you recognize some your worst flaws and enjoy it you know? I participated in the 2016 BooktubeAThon and I managed to read 7 books but, because of that, I am now completely and totally behind on reviews (for a change..)! Kai Ashante Wilson is slowly but surely becoming one of my favorite authors, his stories are tragic, heartbreaking and incredible. Tis story was very close to a five stars but I think that it could have been just a tiny bit shorter. The Long Way to a Small Angry Planet by Chambers was great, it was a bit too slow for me at first but the characters really grew on me and, at the end, I just wanted to live in this world and hug them all! I did not finish Sun of Suns by Karl Schroeder, the worldbuiling was great but I couldn’t care less about the characters and the plot. It was a fast read but I didn’t want to force myself to finish it because I have a ton of other books to read! So, as of right now, I am reading Koijiki by Keith Yatsuhasi and I am enjoying it a lot. I would like to give another chance to Anathem by Neal Stephenson and read some review books. If I have the time, I would like to read Archangel by Marguerite Reed, I read the first couple pages last week on a whim and they intrigued me quite a bit also, I’d like to, at least, start Reaper’s Gale by Steven Erikson but I’ll see if I am in the mood for it!